built by Texas Performance Diesel Inc.
Texas Performance Diesel Inc - Texas Performance Diesel Inc.
Last edited by outlawdra; 02-16-2014 at 07:30 PM. This year we will be adding a antique tractor show along with tractor pulling on Saturday during the day - noon to 5 pm. All antique tractors must arrive before noon to start pulling and 2 pm for the tractor show. Tractors can also come on Friday before 4pm in order to obtain good parking spot. There will be Semi pulling at this event along with any who want to enter the Show-N-Shine, they will be pulling either Friday night or Saturday night along with the trucks. Friday will open with drag racing with a gamblers race and test-n-tune, special prizes will be given away for best reaction times for Friday night among others. Gates open at 4pm for the trucks and race teching starts immediately. Drag racing will run until 8pm then the action moves over to the pulling track. Friday night pulling is Open Pull, this doesn't mean safety ignored but all trucks can pull once down the track. Safety equipment will be teched for overpowered trucks, Open Pull includes all diesel trucks, semis, tractors, etc. $100 for the best distance and $100 for the best crowd applause. Saturday the gates open 10am for the antique tractors, antique tractor pulling starts at 12 noon and will run until 5pm. The antique tractor Show-N-Shine for best JD, IH and others will be at 3pm, all tractors for this show must be there by 2pm for registration. Racing starts again 4pm for the diesel trucks with all classes for DIESEL Motorsports with cash purses. ET Bracket is paying $1000 for 1st place, it is not how fast you go but can you estimate your time consistently. See our web site for classes and rules, DIESEL Motorsports SFI teching will be done before racing. Saturday evening show for diesel sled pulling will start at 7pm for all classes including diesel trucks, semis and diesel tractors. Teching for the classes will begin at 5pm near the weight scales. Vendors will be displaying their wares along with title sponsor Classic RAM, they will be showing the new RAM trucks along with rebates and specials for the dealership. What time Friday evening does the open pull start? 1st DIESEL Event in the Country! March 7/8 in Denton Texas! North StarDragway! The first event of the year! For many this means a chance to test your NEW build before the regular season starts in their area. We have many different trucks coming from all over the US. Friday will open with drag racing with a gamblers race and test-n-tune, special prizes will be given away for best reaction times for Friday night among others. Gates open at 4pm for the trucks and race teching starts immediately. Drag racing will run until 8pm then the action moves over to the pulling track. This doesn't mean safety ignored but all trucks can pull once down the track. Safety equipment will be teched for overpowered trucks. Open Pull includes all diesel trucks, semis, tractors, etc. $100 for the best distance and $100 for the best crowd applause. 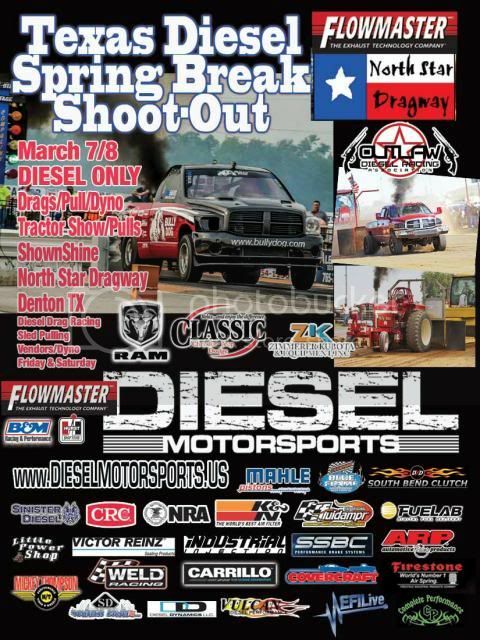 Racing starts again 4pm for the diesel trucks with all classes for DIESEL Motorsports with cash purses. ET Bracket is paying $1000 for 1st place, it is not how fast you go but can you estimate your time consistently. *See our web site for classes and rules, DIESEL Motorsports SFI teching will be done before racing. Saturday evening show for diesel sled pulling will start at 9pm for all classes including diesel trucks, semis and diesel tractors. Teching for the classes will begin at 5pm near the weight scales.